The budget includes a total of $79 million in cuts to the Medicaid program, including $39.1 million in general revenue. Over half of the reductions are achieved through cuts to nursing homes, hospitals, managed care plans and community health centers. Savings of $12 million in general revenue would be achieved through amending the demonstration waiver that integrates funding and care for seniors and people with disabilities who are enrolled in both Medicare and Medicaid. Consumers who have been living in nursing facilities and are unable to transition back to the community would no longer be enrolled in the demonstration. Some of the Medicaid savings would be re-invested in developing more community-based supports to help seniors and people with disabilities live at home. In further support of home-based care, the budget includes an increase of $2.5 million in general revenue ($5 million total) to provide pay increases for home health care workers. Wages for direct service professionals and job coaches who work with adults with intellectual and developmental disabilities would also increase. The budget appropriates $3 million in general revenue ($6.1 million total) for these raises. Fiscal year 2018 will be the first year that the state contributes to the cost of covering the Medicaid “expansion” population for the full fiscal year. The full cost of covering around 71,000 single adults who gained coverage under the Affordable Care Act is $504 million, of which the state pays $27.9 million. This is a 95% federal match, compared to the 50% federal match for other Medicaid expenditures. The budget fails to fund the no-fare bus pass for seniors and people with disabilities who rely on public transportation, proposing instead a $300,000 pilot program for free 10-trip RIPTA tickets for some riders. The free bus pass has enabled these low income populations to shop, attend church, and generally avoid becoming isolated and sicker. Failure to support the free bus pass can obstruct the state’s goal of helping seniors age at home and promoting independence for people with disabilities. The budget also includes $9.6 million in funds for HealthSource RI (HSRI), through which 25,000 Rhode Islanders purchase health insurance and access tax credits to help pay the monthly premium. Small businesses also can purchase coverage through HSRI. Funding includes $2.6 million in general revenue and $6.8 million in restricted receipts (from a 3.5% health insurance premium assessment). Federal funds are reduced from $1.2 million in 2017 to $135,136 for 2018. The budget allocates $10 million for affordable housing in FY18 from the General Obligation Bond approved by the voters in November 2016. This follows $16.2 million allocated for affordable housing in FY17, ($6.2 million from remaining funds from a 2012 General Obligation Bond, and $10 million from the 2016 bond). Another $20 million is allocated for affordable housing in FY2019. The budget proposes to increase the minimum wage from $9.60/hr. to $10.50/hr. effective October 1, 2017. This would put Rhode Island’s minimum wage between Connecticut’s ($10.10) and Massachusetts’s ($11.00), both of which became effective January 1, 2017. The budget does not include an increase in Rhode Island’s Earned Income Tax Credit (EITC), which currently provides 83,000 working Rhode Island families a refundable tax credit equal to 15 percent of the federal EITC. The state EITC was increased two years ago from 10 percent to 12.5 percent, and last year from 12.5 percent to 15 percent. The state EITC stands at 23 percent in neighboring Massachusetts, and 27.5 percent in Connecticut. The budget includes funds to make the Child Care Assistance Program (CCAP) “exit income” permanent as well as to implement other changes required by the federal law, including a 12 month eligibility period and 3 months of continued eligibility after loss of a job. These worker-friendly policies help ensure that children have continuity of care as family income and circumstances change. For example, the “exit income” allows families participating in the CCAP program to retain eligibility until income reaches 225% FPL ($45,360 for a family of 3). Recognizing the importance of high quality early care and education for improving early learning, the budget includes $1 million for quality improvement for providers participating in the Child Care Assistance Program and $390,000 to increase payments to providers in the state-funded Head Start program. The budget proposes to make permanent the $2.5 million in funds to schools to meet the needs of English language learners, $4.5 million for the education of children with high-cost special education needs and $6.2 million (an increase of $1.1 million from 2017) to increase access to high quality pre-K programs. Funding for the adult education system, which provides adults with foundational workforce skills including English language instruction, literacy and numeracy, remains the same as prior years at around $7 million. The budget includes $10 million for the first phase of the new “Rhode Island Promise Scholarship Program” which will provide a free Associate’s degree and reduce the cost of a four-year degree at URI and RIC for Rhode Islanders. To qualify, a student must qualify for in-state tuition, have received their high school diploma or equivalency prior to age 19 and enroll within 6 months of graduation, and apply for all available financial aid. In the first year, $3 million is appropriated for students entering CCRI in the fall of 2017, $6 million for the schools to develop the infrastructure necessary to support the program, and $1 million for outreach. Students entering RIC and URI in the fall of 2017 would be eligible for the program in their last 2 years of school, the 2019-2020 school year. The budget proposes to ensure that online retailers such as Amazon collect the sales and use tax due for purchases by Rhode Islanders, anticipating $34.7 million in new revenue. This modernizes sales tax collection, to reflect the fact that many consumers buy on-line and will help to level the playing field between Rhode Island’s “bricks and mortar” retailers and online retailers, thereby helping Rhode Island communities. This announced change comes as Amazon announced last week its intention to begin collecting sales and use tax from online sales to Rhode Island residents. Increasing the cigarette tax from $3.75 per pack to $4.25 per pack is expected to generate $8.7 million in new revenues ($7.6 million from the cigarette excise tax, and $1.1 million from the sales tax). At $4.25, Rhode Island will have the nation’s second highest cigarette tax, behind New York ($4.35), and above third-ranking Connecticut ($3.90) and fourth-ranking Massachusetts ($3.51). 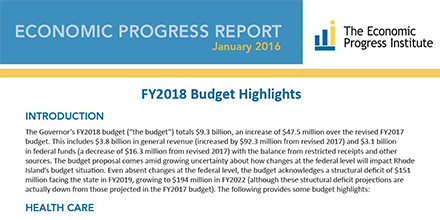 By adding staff in the Department of Revenue’s Division of Taxation, the Governor anticipates boosting revenues (beyond increases adopted by the November Revenue Estimating Conference), by a total of $2.0 million ($750,000 from additional personal income tax revenue, $500,000 in additional business tax revenue, and $750,000 from additional sales and use tax revenues, all resulting from “enhanced enforcement of current tax policy”). An additional $650,000 in new revenues are anticipated from penalties resulting from proposed changes to labor law violations. Rhode Island has relied heavily on economic development tax incentives to encourage employers to either remain in, expand operations in, or come to Rhode Island. The governor proposes $3.5 million for the creation of a new Refundable Investment Tax Credit (“refundable” meaning credits can be given that exceed the business’s tax liability), to encourage Rhode Island manufacturers to invest in and expand their businesses. Unlike the existing Investment Tax Credit the new credit could be extended not only to C Corporations, but also to other corporate entities such as LLPs, LLCs, and partnerships. Another new tax credit, the Refundable Jobs Training Tax Credit is allocated $2.0 million in the budget. This credit is focused on creating jobs in advanced manufacturing industries, and is available to the same range of corporate entities as the Refundable Investment Tax Credit. The budget adds $20 million to the Rebuild Rhode Island Tax Credit Fund (providing gap financing for the development, construction, or rehabilitation of eligible commercial, industrial, residential, and mixed use properties). Additional $300,000 to Polaris MEP (manufacturing extension program) for training, facilities upgrades, and programming capacity. The Governor’s budget includes information about her proposal to reduce the impact of the Motor Vehicle Tax on Rhode Island families, although there will be no fiscal impact in FY2018. Current law requires all municipalities to exempt the first $500 in vehicle value as determined by the Rhode Island Vehicle Valuation Commission (which relies almost exclusively on National Auto Dealers Association (NADA) book-value for New England). The State currently provides $10 million in State Aid to Rhode Island Municipalities to offset revenue lost from adhering to the $500 minimum exemption. The Governor is proposing to change the valuation method, reducing the value of motor vehicles by approximately 30 percent, which would reduce municipal revenues from the Motor Vehicle Excise Tax commensurately. The state will, in turn, compensate municipalities for the difference in revenues. The FY2019 impact of this change is expected to be $58 million (bringing the total impact to $68 million when the current $10 million is included).